Our goal this month is to help children take note of just how much natural life there is at the beach - OUT of the water and along the shore! Kids get so excited when they catch sight of those waves – and who can blame them!? But, just think of how much more exciting a beach trip would be for children if they were fully aware of all that happened around them on the sand in the animal world, too. We've chosen to concentrate on the beach environment, meaning the part of the coast where you find waves. 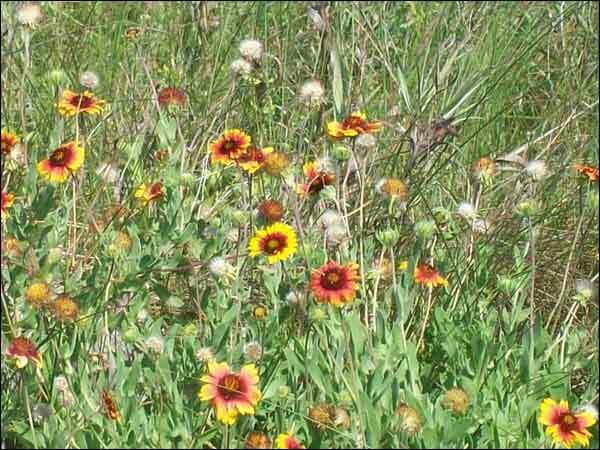 However, the bays and estuaries of Texas also have a plethora of life to explore and discover as well and some of the same flora and fauna we'll introduce can be found all along the Texas Gulf Coast. As we teach children about the life that lives along our Texas beaches, it's easy to picture the ocean water itself as alive. The way it perpetually stays in motion makes it seem almost as if it is breathing. Before you get your feet wet – Please read this! Depending upon where you live in Texas and the social-economic makeup of your classroom, you may have children who have never been to the beach before. We want to be sensitive to this so we don’t send affective filters sky-high during this discussion. As an educator, you know how quickly feeling insecure can shut down a child’s openness to learning. Our focus is on the critters your kids will get to see the next time they go to the beach, not on remembrances of their last trip. That should help level out the playing field for those children who haven’t yet had the chance to wiggle their toes in our sandy shores. You'll notice this month that a lot of our photos are taken by Gabrielle Conley. Gabby is a student who studying to become a nature photographer. We’d like to give a special shout-out and a big "Thanks!" to her. As you can see from her work, there are many ways to experience nature. She enjoys getting out in nature with her camera. Great job, Gabby! Discussing tides with your students is a wonderful way to explore the topic of recognizable patterns in the natural world. If you’ve already taught the phases of the moon, this is a great way to revisit that lesson for a little reteaching. Tides and currents are both responsible for the constant movement of ocean water. We’ve only taught the children about tides, but for your edification, one distinction between the two is that tides are vertical, while currents are horizontal. Simply put: Tides move up and down. Currents move side to side. We simplified our tide explanation for the children and gave the moon the bulk of the credit. And the moon should get most of the credit for our tides. The sun, however, does play a role in tides, but its effect is only about half as much as the moon. The simple explanation is because it is much further away from Earth than the moon and its gravity does not have as much influence over our waters as the moon does. This is a both a high tide and a low tide at its most extreme. When a high tide is its very highest tide possible or its very lowest low tide possible, we say it’s a "Spring Tide." We have two Spring Tides per month and they happen when the sun, moon, and earth are in alignment. In addition, the moon must be full for the high tide at its highest and new for the low tide at its lowest (those are the distinct phases of the moon referenced above). This is a both a high tide and a low tide at less extreme tidal conditions and Neap Tides happen about a week after each Spring Tide (about 7 ½ days afterwards). We have two Neap Tides per month and they occur when the sun, moon, and earth are at right angles to one other. That high tides do not happen at the same time everywhere in the world. Kids might want to think of the world as a giant fish bowl. They might envision the ocean as sloshing from Texas during our low tide on over to the other side of the globe to give another part of the world its high tide and then back to us for our own high tide. That as soon as high tide is over, low tide begins. The minute the water reaches its farthest level from the sea and begins its return to the ocean, we can consider low tide to officially have begun. From that point on, the waters begin receding until they reach their lowest point of low tide. Then the cycle starts all over again. As we wrote on the Student Research Pages, it’s a good thing seawater doesn’t get tired! Whew! Our oceans truly never, ever stop. High tides don’t happen exactly 12 hours apart. The length of time between high tides depends upon the phase of the moon, the alignment of the sun, moon and the earth, tidal activity in the deep ocean, Earth’s rotation on its axis, and the shape of the coastline. In other words, it’s a pretty complicated topic! That's why we depend on tide tables to tell us when the tide is coming in. We say, "12 hours" apart, because it's usually somewhere around that (but can sometimes be up to 12 hours and 48 minutes). That low tides do not happen at the same time everywhere in the world. That as soon as low tide is over, high tide begins. Low tides don’t happen exactly 12 hours apart. You've probably already touched on the Gulf of Mexico in your teaching by now, but since it's such an important part of this month's discussion you'll definitely want to revisit the topic. This is a great time to pull down the map and show the kids again where it's located. Show them that every single beach in Texas is located on the Gulf of Mexico. Ask if they can see what is meant by the fact that we consider this body of water "bowl shaped." Ask them if they see why people mistake it for its own ocean. Ask them if they can recall which ocean it really belongs to (the Atlantic). Make sure to distinguish between the "Gulf Coast" as the land along the ocean and the "Gulf of Mexico," which is the actual body of water itself. Discuss what a "gulf" is, using the map as your guide. A visual will go a long way in this case! Assign partners and have each partnership use a Texas map with a scale. Have the children find where they are on the map (your town). Then have each partnership choose a Texas beach city or town that's on their map. Using a ruler and the map's scale, have each partnership find out how far away they are from the Gulf Coast town or city they chose. Then, create a rate problem and have them determine how long it would take them to get there if they traveled a certain number of miles per hour. If you're already at a beach city on the Gulf Coast, pick a spot in the Panhandle and have some pretend visitors coming to visit you. Have the partnerships figure how many miles the visitors would have to travel to visit you and then how long it would take them to arrive. What Lives Along Texas Beaches? The big idea this month, as we've already noted, is to get kids who visit our Texas beaches to notice all the life on its shores! Truly, there is an amazing amount of wildlife living there. And, what lives there must have special adaptations that allow them to survive in the harsh conditions. You’ll recall there are two main types of adaptations: Physical and behavioral. Body structures that allow an animal to find and consume food, defend itself and reproduce. This PowerPoint, created by educator, Ms. Weinberg, does a terrific job of teaching the children about the two. We recommend that you show them this PowerPoint before reviewing what they learned on the Student Resources Page about the animals. 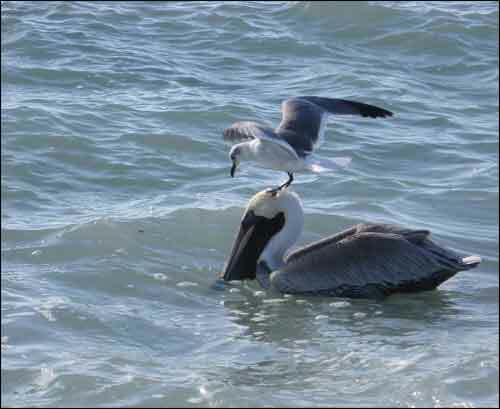 Afterwards, discuss the beach critters from the perspective of physical and behavioral adaptations. Ask the children to help you categorize the animals according to their adaptive style. Ask, "Do you think this animal has mostly physical or behavioral adaptations that allow it to survive in the beach environment?" One issue you’ll want to be sure to touch upon is a general lack of fresh drinking water in the beach environment. 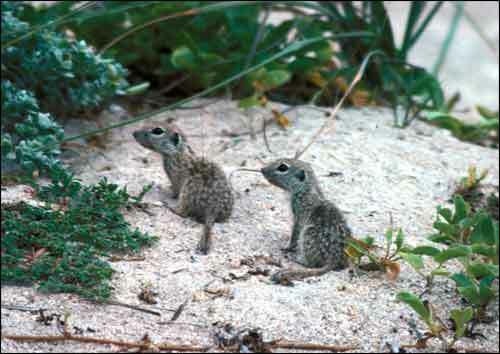 Kangaroo rats have a very special adaptation that we note below, but other animals that live at the beach also have found ways to live without much fresh water. Ask your kiddos how they think these animals find water or survive with little water. Explain that animals cannot drink seawater (and that humans cannot either). In fact, drinking seawater would kill them because the salt content would dehydrate them. To prepare for your discussion, bring in small items such as nutshells and bottle caps. Show the children that even these items can capture water. Discuss with the children what "dew" is and how it can supply animals with precious drops of fresh drinking water that helps keep the smaller animals alive. Spotted ground squirrels are big-time scavengers. In excavated nests from deep within the dunes, biologists have found dead insects, remains of washed up fish, leftover picnic trash, and just about anything else edible (or once edible)! They are also very quick and must be to survive since these rodents provide favorite meals for raptors and snakes. 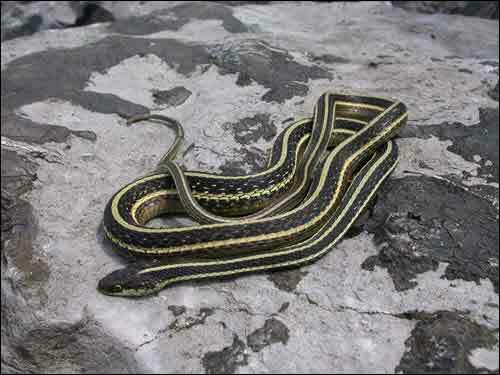 Gulf Coast ribbon snakes have adapted to eat anything they can find as long as it fits into their carnivorous diet. 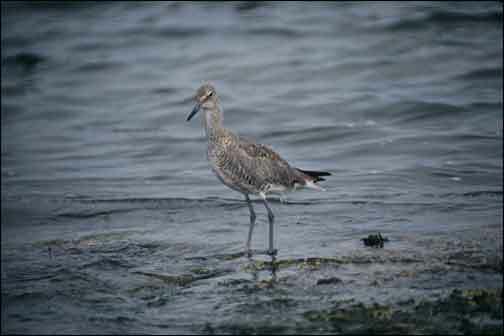 Willets walk along the surf poking their long bills in and out of the wet sand in search of food. They will use their bill to probe, bobbing their head constantly, as if checking all possible spots for food, leaving no sand unpoked! 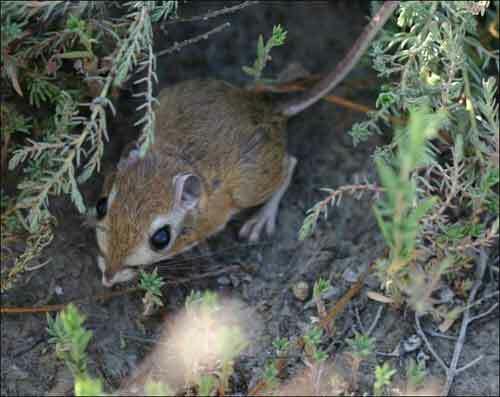 Gulf coast kangaroo rats have special microscopic tubes that remove the liquid from their urine and turn it back into water. In this way, any liquid that comes from their food (i.e. the seeds they eat) becomes the water they drink. 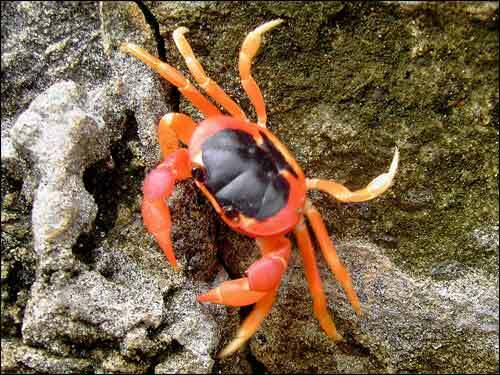 Blackback land crabs have an exoskeleton and, like all animals with exoskeletons, they must shed it and grow a new one at times. Blackback crabs have developed a rather interesting adaptation to protect them during the times when they’ve just shed their hard shell and before they've grown a new one. Ready to hear it? Beware! It’s very...ugh...different. The blackback crab creates an internal 'skeleton' made of gas from its guts until a new exoskeleton can be grown to protect it. 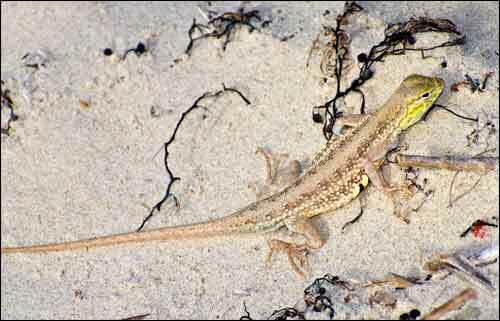 Keeled earless lizards have no outside ears and that keeps sand from getting stuck in them. (Photo ©2010, by Bill Gorum, used under Creative Commons, URL: http://www.herpwiki.com/photo/642-holbrookia_propinqua_propinqua. Foredunes – this is the first set of dunes you’ll come to after the beach. This will be the most unstable set of dunes as they will be the least protected from the wind and the water. They are also the first line of defense in a storm and very important. 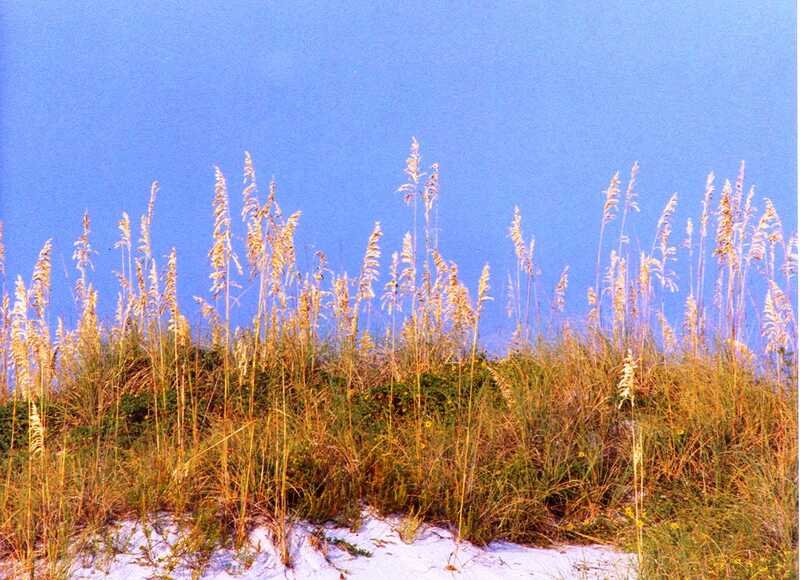 Once destroyed, the foredunes should always be restored. Backdunes – these will be the most stable dunes as they are the most protected and vegetation has usually had a good chance to dig its roots in and get established. Like the ocean's waters, our coastline terrain is a mobile environment. Stabilized, vegetated dunes provide the best natural defense against storm-surge flooding and beach erosion. We found out the hard way that too much urban growth too quickly made us vulnerable to storms when, in 1983, Hurricane Alicia, wiped out all nearly of Galveston Island’s foredunes. 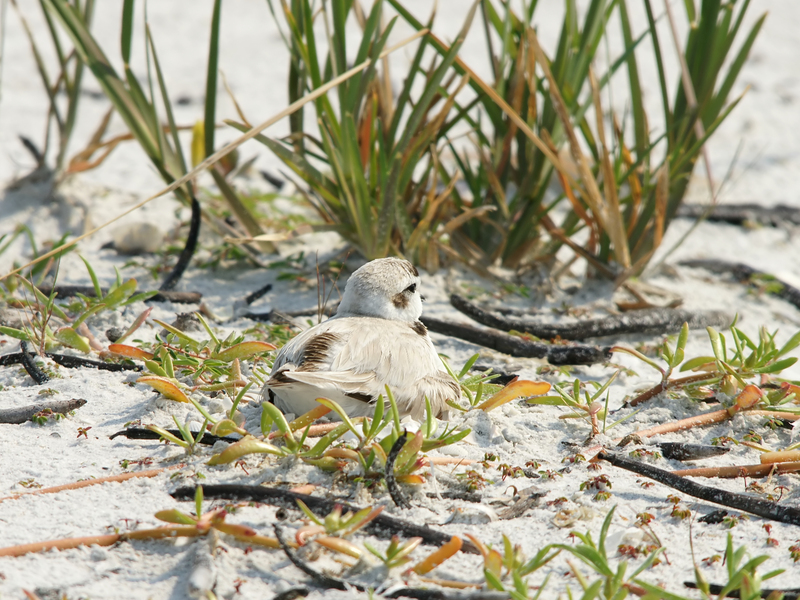 That’s one big reason efforts are in place to restore dunes whenever possible. And, even with such efforts, hurricanes like Ike in 2008 still did serious damage to Sea Rim State Park (just after it had been repaired from Hurricane Rita and just before it could be reopened to the public). 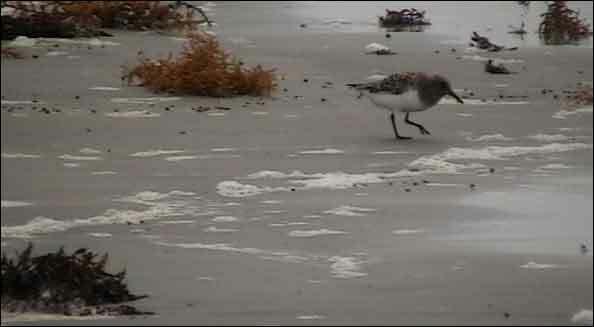 And efforts are currently underway to rebuild damage that’s been done to some of Mustang Island’s dunes by storms. 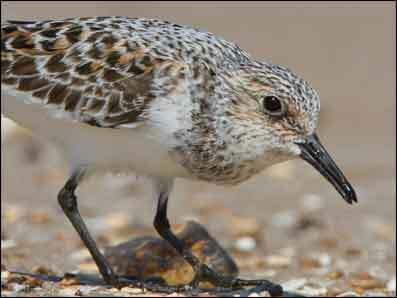 Yes, restoration efforts will continue in perpetuity in acknowledgement of the important role these "lumps of sand" play as nature’s natural buffers again storms. Not to mention, of course, the important role they play in providing very special homes for our very special beach animals! 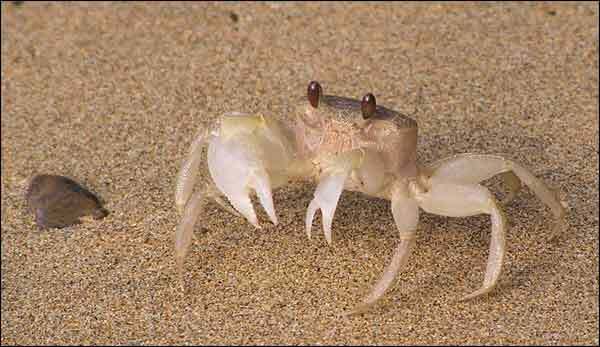 That, like the animals that live here, they too have adaptations that allow them to survive in the harsh beach environment. 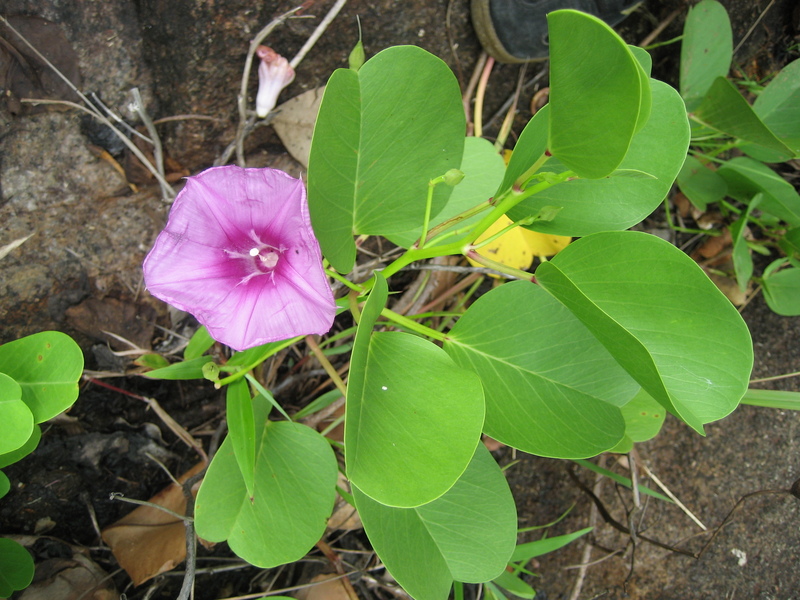 For example, all of these plants have to be able to grow quickly enough to avoid be smothered in quickly shifting sand! Beach morning-glory has flowers that don’t get as big as regular morning glory flowers so they don’t need to use as much energy creating them. Their leaves are also thicker and waxier so they don’t lose water as quickly. (Photo by Marion Schneider & Christoph Aistleitner). Beach evening primrose grow in clumps, conserving energy and water. The flowers are bigger than the leaves perhaps to help attract pollinators. Photo by Gabrielle Conley, © 2011. Much of Texas’ economy is based on tourism so when folks come and see that "ugly" seaweed on our beaches, chambers and visitors’ bureaus in beach communities often feel pressured to get it out of there. The truth is, once sargassum washes ashore and sits in the hot sun, it can get a little stinky and the flies love it. So, folks who say the sargassum’s gotta go have a point, don’t they? Who wants to sunbathe next to that? However, on the Student Resources Page we’ve discussed how vital sargassum is to the wildlife that live here and we can’t stress enough how important a role it plays in the beach ecosystem. When sargassum washes in from the ocean it often brings miniature feasts tangled up in it. Once ashore, it becomes a hiding place for more little “feasts” and, well, we already mentioned there are those flies. Put it all together and you’ve got a regular banquet for birds! And, when the birds are done feasting on flies and little feasts or when high tide comes, whichever comes first, the sargassum gets washed toward the dunes where it may become incorporated into the structures so that it can help sand accumulate. There it also might provide a healthy snack for insects and spotted ground squirrels and once again provide hiding places for the beach’s littlest creatures. This is a great topic for a classroom "debate." Discuss both perspectives: the tourist’s (or the director of a beach-area visitors’ bureau’s) and the perspective of the wildlife (or wildlife lover’s). Throughout your discussion, try to stress the need for balance between mankind and nature. Explain that if it’s truly a goal, humans and wildlife can live in harmony. It doesn’t have to be either-or. The children need to know that they are our future solution-finders! We can find solutions and that they are the ones to whom we will be looking for such solutions. Their ability to find these solutions in the future begins with these sorts of conversations today. What would they do about that stinky, "ugly" seaweed on the beach if they were in charge of attracting tourists to our Texas beaches? Should it stay or should it go? Let the debate begin! Wiggle in the Waves Here!